Or view larger version. 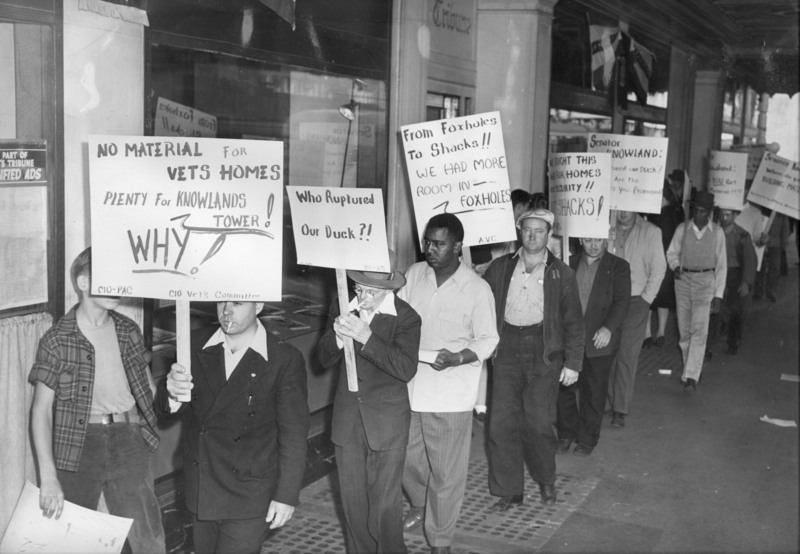 World War II veterans protest the lack of housing with signs reading, "From foxholes to shacks!! We had more room in the foxholes.". 1946. Photographer unknown. Gelatin silver print. Collection of Oakland Museum of California. The Oakland Tribune Collection. Gift of ANG Newspapers. In this 1946 photograph, an interracial group of picketers line the front of the Tribune building-owned by the family of Republican Senator William Knowland. Their protest centers on Knowland's refusal to support low-income housing in the Oakland Hills. As I.L.W.U. and C.I.O. union members understood, minorities had a great need for government-subsidized public housing. The reason was not poverty, but racial discrimination by real-estate agents who would not sell African Americans homes in neighborhoods covered by restrictive housing covenants. The situation was similar in Southern California. In Los Angeles during 1946, African Americans accounted for 7 percent of the city's population, yet filed 46 percent of all the applications for the city's public housing. Raisin in the Sun, by Lorraine Hansberry, named "Best American Play" by New York Drama Critics in 1959. Film version from 1961 stars Sidney Poitier, and Ruby Dee. Story explores the impact of restrictive housing covenants on an African American family living in the Southside of Chicago.